One question I hear a lot from radio callers, blog readers and conference attendees is whether I think that unknown, upright canine creatures are related to UFOs. It’s actually a concept that’s been around for some time and is also asked in regard to Bigfoot and other cryptids. My usual answer is that while I don’t have any reports from witnesses who’ve seen a dogman hopping directly off a UFO (although I know there are a few cases where people have claimed this about Bigfoot), it just so happens that places where mystery creatures abound are also often UFO hotspots. A perfect example of this type of area is the northern unit of the Kettle Moraine State Forest which stretches through Sheboygan, Fond du Lac and Washington Counties in Wisconsin. This wooded, well-watered and hilly terrain encompasses the Holy Hill region which has had numerous sightings of upright, wolf-like creatures — probably the most famous of which was the 2006 incident where the DNR’s carcass removal contractor saw one such beast drag a fresh deer from the back of his pickup truck. It’s also an area where many Bigfoot have been spotted, and includes old legends of a Goatman and ancient sacred places to boot. It’s just as well known for its UFO activity. The city of Hartford, in fact, was named the site of one of the Top 10 UFO Cases of 2012 by the Mutual UFO Network, or MUFON. The incident occurred July 13 when a woman in her 50s and her daughter both saw a silent, lampshade-shaped object equipped with lights and measuring about two hundred feet long zip over the trees in their yard before shooting away in classic UFO style. The sighting lasted about half a minute, which is actually longer than most sightings of unknown phenomena. The little town of Dundee, one of Wisconsin’s three self-proclaimed UFO capitals (the others are Elmwood and Belleville), has a long history of unidentified flying objects in its skies. A woman I met at a library signing told me of one that she’d had just off Hwy. 67, about ten miles south of Plymouth, on her family farm at the age of ten in November, 1967. She had been sent to fetch some chickens, whose wings hadn’t been sufficiently clipped, from a tree. She was busy pulling them out when she saw a large, silent, cigar-shaped craft hovering just above a nearby tree only forty feet away. It had small portholes or windows, and on one end were two curved, pipe-like appendages that emitted yellow and blue, laser-like lights that appeared to float off on their own. It eventually zoomed off but the girl had quite a long look at it. She didn’t know if the craft’s occupants were aware of her. She also had an aunt who saw a round, disk-like craft over her fishing boat in the same general area. That has pretty interesting implications, if true. 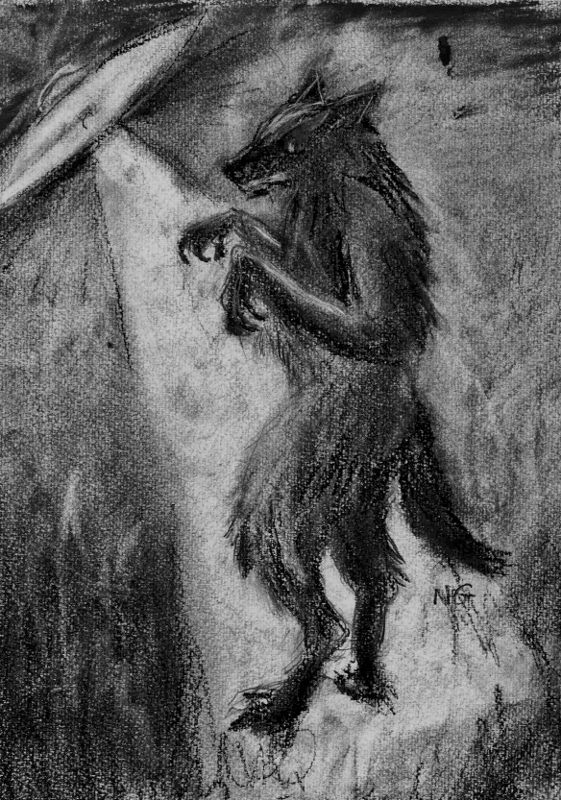 I’ve never received a report of a dogman with wings, although plenty of people have claimed to have seen flying things with hairy, un-bird-like bodies. But it hints at some sort of Protean, multi-formed entity able to look like several different animals or a blend of them, with some connection to weirdly behaving lights. And yet, most dogman and Bigfoot witnesses believe they have encountered solid, flesh-and-blood creatures. Keel also thought the lights he saw in Pt. Pleasant were “mischievous masses of energy,” but the two witnesses mentioned above who saw UFOs in or near the weird-creature-infested Kettle Moraine both described craft-like forms with defined shapes. Perhaps they were entirely different phenomena – who can really say? I have to confess that I’ve been working on a case for several months that involves large, bipedal canine prints that do such inexplicable things as appear suddenly in the middle of a secluded field, then track into nearby woods. They seem to belong to some large animal that is somehow able to obscure its image from multiple trail cams as it drags or carries off deer carcasses. The trail cams have caught weird, anomalous lights overhead when these things occur – all of it so far unexplainable. The investigation is still in active progress but I’ll admit it has me questioning some of my own biases at this point. Still, even that case isn’t solid proof of a relationship between the unknown creatures and mysterious lights or sky vessels, to my mind. But I do believe that the fact that they often appear in the same areas and sometimes the same time frames, too, means that any open-minded investigator ought to take a serious look. Our universe is seldom simple or predictable, and perhaps there’s an unimagined answer out there that no one’s thought of. Yet. I think we’d best keep looking for it. buildings, a clustered handful, are painted the color of cream. On a blue sky day they are like clouds pulled to earth and given wooden skeletons. Pristine as sea salt. The crimson of even a lone cardinal’s wing would look garish against all that white. But imagine the road in the photo turned to dirt, picture it in the year 1872 when Buffalo County’s first fair was held right there in the street. Those stark cream frames a melee of horses, buggies, oxen, pigs and dusty-booted pioneers. Animal grunts, piles of manure and a table set with berry pies and cornbread. One of those buildings housed a dance hall in 1903, and in its time it held masquerades, turkey shoots and medicine shows. It was the Broadway of Buffalo County. The clot of dwellings was once called Eagle Valley, which is strange because Cream and Buffalo County are now home to hundreds of golden eagles that never used to live there. Bald eagles are native, goldens are not. No one knows where they came from. Scientists presently stalk them, to band their thick legs and follow them home.